UI – Part 107 – Caliphate – Wake Up! Wake Up! The term ‘Caliphate’ is often heard in reference to Islam. The Caliphate was initiated with Muhammad as the leader of the community of all Muslims. It would be a parallel to the Pope for the Catholic Church. However there has been dispute, notably between the Sunni and Shi’ite factions, as to the person who would be this leader. Today there is no Caliphate. It was ended with the Ottoman Empire in Turkey in 1924. The fundamentalist Muslims, the Islamists, desire a return to the Caliphate. The Muslim Brotherhood was started in an effort to create momentum for a return to the Caliphate. This happened in Egypt in 1926. 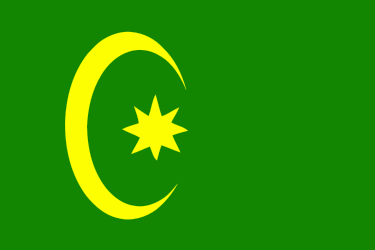 The Flag of the Caliphate (1517-1844) is pictured. Abu Bakir – 1st Caliph – not in the lineage, family heritage, of Muhammad. Should the Caliph come from the lineage of Muhammed – as a monoarchy? Should the Caliph be chosen from all Muslims as the scholar of greatest knowledge? Appointment – disagreement on successor to Muhammad. Some envision the progress, or succession from Prophethood (Muhammad) -> Caliphate –> Violent oppressive rule –> Tyrannical rule –> Caliphate –> Prophethood. A cycle, within which today we find ourself, or the Islamists, under ‘violent oppressive rule’ without a Caliphate. In my opinion the division between Sunni (the dominant Muslim group) and the Shi’ite may preclude a return to the Caliphate without either a war between factions or some form of settlement, agreement, over interpretation of the Quran. This may be impossible. What must also be considered are other sects, tribes, or interpretive differences of the Quran that exist in the Muslim world. There are millions and millions of moderates that may side with succession theories of either Sunni or Shi’ite, but do not agree on an irrational approach to Islam as evidenced in the more extreme quarters of the Sunni, to include the Wahhabists. In discussions concerning Revelation v. Reason it has been shown that the Islamists have chosen an irrational approach to Islam evolving more an ideology than a religion, again my view, that hides behind and uses Allah as a shield for their offensive to control the Muslim world. If successful this mindset can only result in chaos and a return to living standards of the most primitive past. The Islamists oppose ‘modernity’ using the West, and democracies, as the example of all that Islam should not be. What is denied is ‘progress.’ Without progress and an appreciation and understanding of how things work, the cause for events or developments or products made, thinking that all is according to Allah’s Will, man’s hand and mind (reason) need not be considered, will return the Islamists and their subservient followers to the dark-ages. Items enjoyed or useful today, luxuries, the food-stuffs, the weapons, the transportation, the architecture, the comforts of living (like air conditioning), computers, the internet, and so much more will fall to ruin as only Allah will be there to maintain, repair and create anew. Today the Islamist enjoy the spoils of the West, capitalism, and progress. They have had the opportunity to build productive nations, yet failed in doing so. If they succeed in their imperialistic take-over, destroy all infidels along the way to attain a world All-for-Allah, what they enjoy today will not be available under their command. This is irrational. An Islamist’s Caliphate will lead the Muslim world into ruin. It will be a stand-still culture. In the past there were those who would give consideration to ‘reason’ applied to the Quran – the Mu’tazilites. They were logical and brought Greek philosophical thinking, that of Aristotle and Plato, into their understanding and interpretation of the Quran. Man was given credit for thinking and even doubting. They led the Muslim world to write, to discover and invent and caused them to become a notable mind-set for the future. The Mu’tazilites, according to Robert C. Reilly, “created the first fully developed theological school in Islam (kalam), championed the primary role of reason; reason’s ability to know morality; the goodness and justice of God as required by reason; the unity of God; and the necessity of man’s free will.” Then the Ash’arites came along. The Ash’arite mindset is prevalent in that of the Islamists. If you do not follow their thinking and the advice of the scholars to which they subscribe you are an apostate and subject to die. This irrational logic applies today. Turkey became a secular country in 1924 under Ataturk. Not only did he stop the Caliphate, he struck down the use of Sharia law in his country. There are cracks in the political network in Turkey today suggesting a leaning towards the more radical thinking. We can only pray they preserve the separation of mosque and state and continue to be the great country that Ataturk envisioned. Indonesia is also secular, yet the radicals are trying to change things, alter the landscape and introduce the irrational into the rational. May they not succeed. Who Can Lead the Muslim? There is an internal struggle in the Muslim world for leadership and dominance. Call the leader what you want, Caliphate or simple by name as a worthy leader speaking common sense. Whose interpretation of the documents of Islam will control? To gain control weapons will remain at the side of male Muslims (and others willing and wanting to pull a trigger) ready to kill another in disagreement at a moments notice. Just about anyone is potentially an apostate, a target; the Christian and Jews are target practice. There is only chaos, that has been the situation for centuries and will in all likelihood be the situation for centuries to come. In the meantime expect the violent nature of the Islamist to continue with acts of terrorism, attempts at recognition and control, the use of the media to express outrage and persecution, and an expressed desire to have their views be the views of all Muslims – the umma-grand to continue. It is an Imperialistic strategy, a holy war to achieve a world all-for-Allah. There are many heads to this snake; yet what is sought is one commanding voice and opinion that ALL will follow. This is Biblical! Pray for understanding, an awakening and reason to find the heart and mind of the moderate Muslim ummah so what emerges is peaceful, sensible, and demonstrates goodness towards all peoples, not just those of Islam, but those of the Bible, and even those who are in denial. Let us all find our way on our own, guided by our mosque, church, synagogue and available literature to decide for ourselves, to erase our doubts and find the path most open to salvation and a life eternal. I have found mine (see my book Wake Up! Wake Up! The Testimony of a Layman – available at amazon.com and tombalderston.com). May the Love of God, the Grace of Jesus Christ, and the Fellowship of the Holy Spirit be in you and with you.